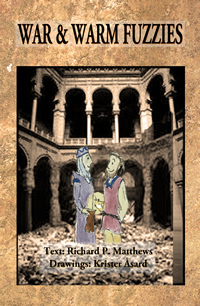 War and warm fuzzies don't exactly go together, and that's exactly the point of a new book by Richard P. Matthews, War & Warm Fuzzies (I recently got to review the ebook). It has a message that really seems obvious, but unfortunately isn't played out in the world around us. Two best friends are torn apart by a senseless war that's caused by ethnic hatred (sounds like the root of so many conflicts nowadays). The country is deceived by a Wicked Witch, and the only way to stop is to spread Warm Fuzzies all over the land. It's a simplistic message, but one that really needs to be repeated and emphasized until people truly live by it. Richard P. Matthews is a spiritual teacher who has devoted his life to bringing others to their Spiritual Centers and the 'Great I Am' within. Richard has been meditating since he was sixteen and practicing yoga since he was twenty-one. He travels throughout the US and Europe doing storytelling, meditation workshops, and starting new meditation groups. Richard is published in Swedish and English and is the author of A NEW CURTAIN OPENS, STORIES FOR YOUR SPIRIT (4 volumes) and many published articles. For more, please visit the website: www.RevitalizingMinistries.com.